You can see some actual monsters wandering on the field. 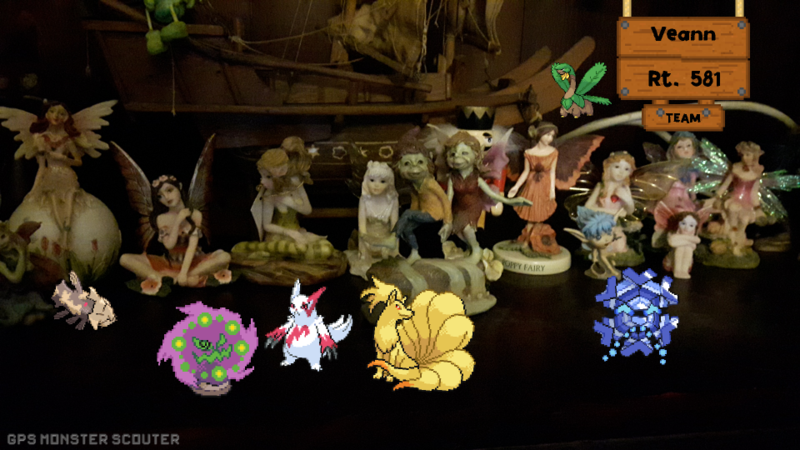 Start a wild battle when near them, and you’ll meet them in battle, among other wild mons. They’re not really different from the others you can normally find, but in case you spot something interesting or rare, you can just go there to get/fight it. Plus, adds to the atmosphere. Enabled, disabled, or… non-desirable only, meaning that legendaries and shinies will not appear in case this feature doesn’t suit your play style. If perhaps you find yourself near a monster while you’re on “non-desirable”, you can still momentarily change to “enabled” to check if it turns into something rarer or not. The one and only Pokémon pack from now on! Multi-gen, Multi-style, and with sounds and cries! Compatible only from app version 0.22. Update the app if needed. Instructions: the zip contains a folder named ‘poke7c_data’. Copy and paste this folder inside the ‘GPS Monster Scouter\sounds’ folder on your device. Images from PokéSprite project, and Smogon’s XY and Sun/Moon Sprite project. When you start a new adventure with a multi-gen pack, you are now asked which gens you want to play with. This will allow the use of one single pack for every case, and also any possible combination: not just one of them or all, but also 1-2-3, 5-6, 2-4-6, 1-7, whatever you like. Each combination obviously causes a different distribution of families. Choose well, because you can’t change the chosen gens afterwards, or in a already started save data. …Unless, you get the ‘Gen Selector’ key item! It’s a very powerful item, so I decided to set a pretty higher donation amount for it (of course donations also support my continuous work, it’s not just about purchasing an item). Check the donation thread on reddit to find info on it. If a pack supports multiple styles, you can select your preferred one from the Preferences. Again, this allows the use of one single pack for any use case, without the need to have a different version for each type of player. Sounds can now be loaded indifferently from either inside the pack, or a pack-specific external folder, more or less like musics. Some supported sound effects for now are a “shiny” chime, to be played when encountering a shiny opponent in battle, and a “legendary” chime to be played when a legendary appears in a route. The main improvement though is about monsters’ cries. They’ll be played in battle (just the opponent), and you can also hear them in dex and status screens by tapping the monster image. But they’ll also be used for atmosphere. While you’re exploring, you’ll hear cries of near and far away monsters, most from the route family, but maybe even the families nearby, or even the local legendary. 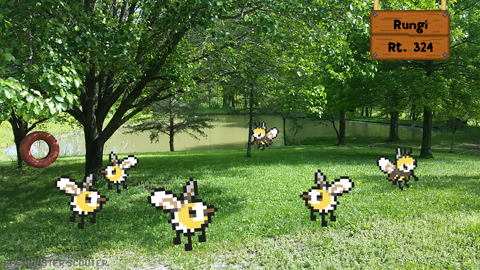 You can even hear swarming mons when you activate a bait. I think exploring while listening music and random nearby mons’ cries is really a great experience. But what if I only like some of all these sounds? From the preferences, you can now activate/deactivate separately musics, radar beeps, cries from routes, cries in battle, and effects. If you previously set it as “Music only” in an old version, to deactivate radar sounds and just hear music, you’ll automatically find the radar sounds turned off in this new version. All the rest is turned on by default, so you may want to adjust it to your needs. You can now snap a picture of all the monsters contained in one of your boxes, all together in the same place. Let them come out to get some fresh air! Just select the new option from a box’s option list, and take a shot of all your monsters together. Now, most of these improvements, to be experienced, require a pack to support them. And that’s what we’re about to have. “poke7”, “poke7bt”, and any “pokegenX” packs distribution will be discontinued, and they will all be replaced by the new pack “poke7c”, which stands for COMPLETE. Create a backup of your save data, and import it when you start using “poke7c”. The pack will be published very soon. “poke7c” pack will be multi-gen, with all the 7 gens selectable, and multi-style, with both battle sprites and box sprites. It will include shiny and legendary sound effects, and will be distributed with a separate downloadable pack containing all the cries. – Existent save datas and backups from “poke7” and “poke7bt” packs are automatically set with all 7 gens. – Backups from “pokegenX” packs (like pokegen1, pokegen2, …, pokegen7), when imported to a multi-gen pack, will have their original single gen automatically set. – Version 0.9.1 of the “poke7bt” pack and version 1.7.1 of the “poke7” pack, published a couple months ago, were already multi-gen compatible, but they contain some mistakes, so I recommend using “poke7c” instead anyway. – If you want to use them, cries or other external sound effects must be placed in a pack-specific folder on your device memory. The game will create the new folder ‘GPS Monster Scouter\sounds’, and all the sounds for a pack should be inside a ‘GPS Monster Scouter\sounds\(pack name)’ folder. So, for the “poke7c” pack, it will be ‘GPS Monster Scouter\sounds\poke7c_data’. The downloadable cries packet will provide you a folder named ‘poke7c_data’ with all the files, so you just have to paste it inside the ‘sounds’ folder. That’s it. – For pack authors, producing a pack with these new features will require a new version of creation tools. It will be distributed some time later. Ask me if you need it asap. After the last update post about version 0.21, I made many different minor updates that first went into beta and released some time later, and I didn’t create a specific post for each of them. But before I release a new big update, coming in a few days, I just wanted to recap everything up to now. You may have read about all of this in the game’s changelog already, but let’s do it anyway. – Massive update for the status screen: More info shown in it, and some of them (hatching distance, PPs) updated in real time. All the monster options are also available from inside it: evolve, hatch, manage items, manage TMs, set nickname, release. The boxes buttons have a new mini button that brings immediately to the status screeen. Loading speed while navigating between boxes and status was improved. The usual long press options are still usable anyway. – From the boxes’ options, you can set the currently displayed boxes as the default ones that are opened every time after boot. 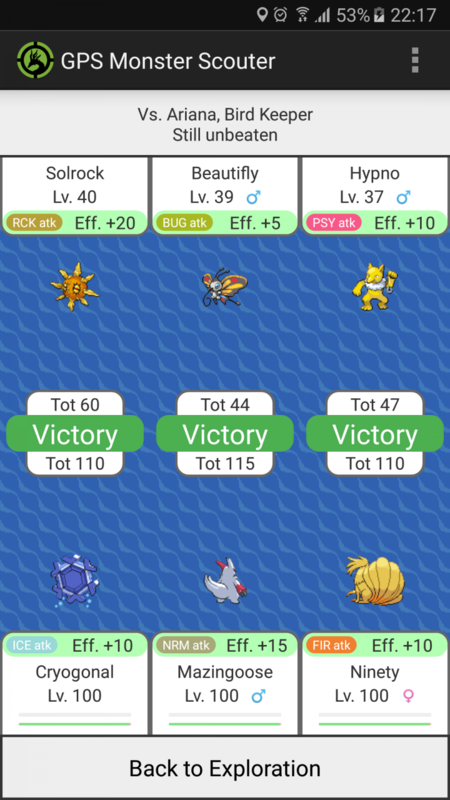 – The route view is now drawn on screen in a whole different way, it’ll make future changes easier, and that bug where sometimes trainers became tiny shouldn’t happen anymore. – Notifications have been adjusted and, depending on your device, you might want to change how the monster icon is displayed. There is an option in the preferences. If you don’t see it, it isn’t needed in your android version. – Cursor will take the direction of your movements while moving, regardless of how bad your device compass is pointing north. It may need adjustments on the minimum movement speed, let me know. – A bit more info when evolving, showing the full form name (ex. “Lycanroc (midday form)”). Needs to be improved further. – When asking questions to the player, if an answer is more relevant than the other, relevant+good answers are shown in blue, relevant+dangerous answers are shown in red. – Status minibutton slightly bigger, and you have many options in the preferences on how you prefer accessing the status screen. – If you prefer having more pixelated images (without filters) you now have an option in the preferences. Might need adjustments, give me feedbacks if you use it. – Evolutions requiring TMs learning now supported. – Some little graphic changes and fixes. – Some urgent fixes and changes. – Plus special battle rule for… a certain special species of the first gen! The big update coming next is about both the app and the packs, so expect a lot more info soon. Thank you! Use the new ‘complete’ pokémon pack, it is multi-style and you can select battle sprites as images as well. The one that’s going to replace the most appreciated pack! Has all the cool features of the classic Pokémon Data Pack, but with bigger monster sprites, and back images! 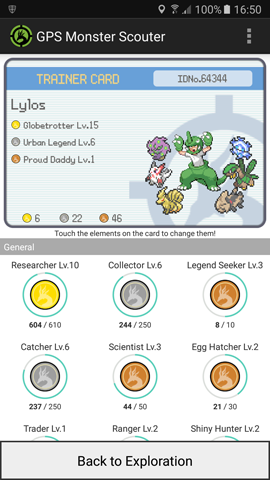 Updated to version 0.9.1 with US/UM new species and tm evolutions. Compatible only from app version 0.21.5. Update the app if needed. 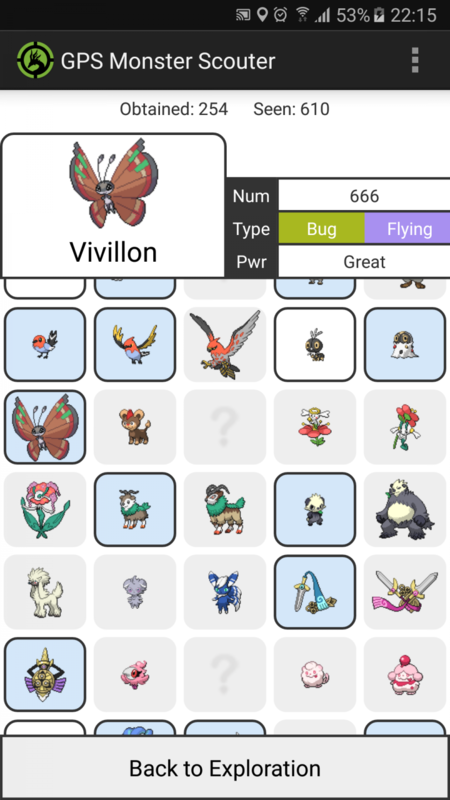 Currently below the 1.0 version because it still misses some shiny/back/new forms images. 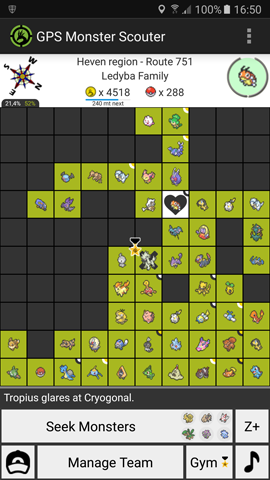 Use the new ‘complete’ pokémon pack, it is multi-style and you can select box sprites as images as well. 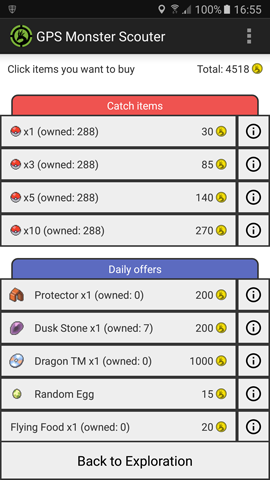 Updated to version 1.7.1 with US/UM new species and tm evolutions. A brand new update for the new year. 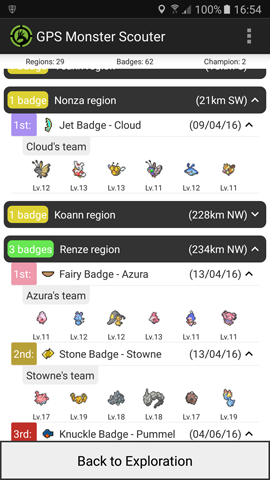 You can also get a view of a distant region if you got a badge in it: just press the new button from the badges screen. Any of them still has the usual functionalities plus the new scroll. If you zoomed the region map to your current zone, and you move in a different zone, the view will follow you to the new zone automatically. Just a new option to forget a TM, if your monster knows one. You won’t get the item back though. The name of the pack you’re using is shown at all times under the app name. On newer android version, the app icon should adapt to your preferred shape (circle, square, squircle, etc). It’s an even bigger update codewise, so if you encounter any issue be sure to let me know. The Christmas and New year events are back! Play from 23rd to 26th december, and from 30th december to 2nd january for some surprises! Remember to update the app to the last version. More updates for the app coming in january! Stay tuned! The Halloween event is back! Play from 28th october to 1st november for scary appearances! Want to create a new data pack? See all the instructions and examples. For any help you can contact me at tankenka(dot)gms@gmail.com, or on reddit or discord!